JVC has established a new and dynamic relationship between cartridge design and quality by inventing the Pulse Train Analytical Method. 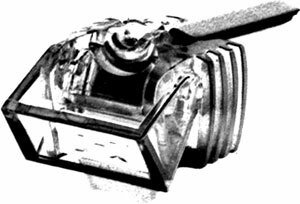 The X-1 phono cartridge was the first product designed with the new method. For 2 and 4-channel use, the cartridge features a wide range, clear definition and transparent tonal quality. It faithfully reproduces silence, however transient, between notes and adds tremendous presence to the reproduction of music. JVC X1 / X-1 owners manual, service manuals and schematics are for reference only and the Vinyl Engine bears no responsibility for errors or other inaccuracies. The PDF files are provided under strict licence. Reproduction without prior permission or for financial gain is strictly prohibited. This website is not affiliated with or sponsored by JVC. Thorens 126 Ii - Smelly Smoke!